This link: A Passionate Geography will take you to the route that Arthur and his men took, from England to Rome, in pursuit of wresting the authority of Rome from Lucius. 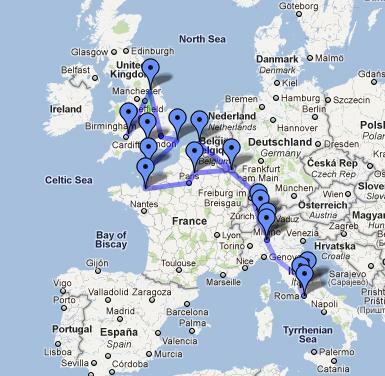 I made the map in Google Maps; you can see a screen shot of the itinerary, below. Making allowances for the vagaries of travel, textual and personal confusion, and changes in travel routes from medieval to modern times, this is the route that I followed over the course of my sojourns. For me, there are still loose ends, primarily the inexplicable detour from Luxembourg to Flanders. Though I passed through this terrain, it was done “out of order,” and I still feel the need to go back to sort it out. In 1979, Malory scholar William Matthews wrote the essay “Where was Siesia-Sessoyne” in the journal Speculum (49:4) to try to sort out part of the confusion about this section of the route.